Arvind Oasis, Where your home is nestled between soothing water-bodies and serene greenery. And convenience and connectivity is just a walk away. 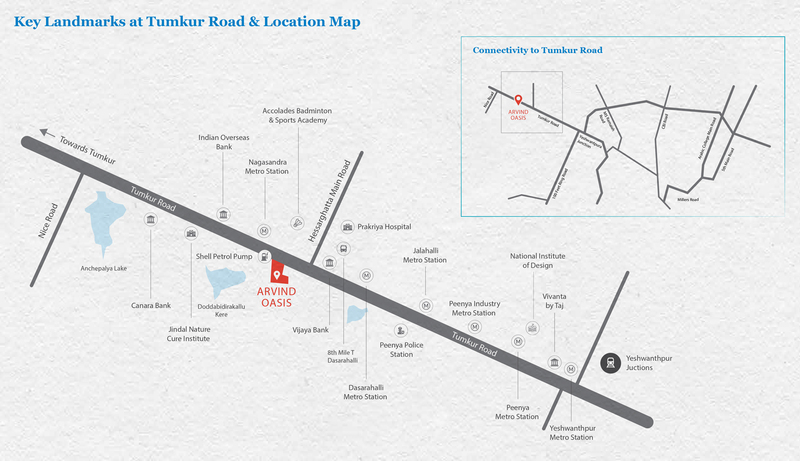 Discover your abode of beauty and tranquillity, just 200 metres away from Nagasandra Metro Station. Forget traffic, because you’re going to get used to the comfort of riding on the metro. Forget stress and worry, because everything you need to relax is right at home. Forget planning ahead for weekend shopping – and go by impulses. It’s just a ride away. Forget choosing between working late and dinner with family. You can simply do both. Disclaimer: Any content mentioned in this website is for information purpose only and Prices are subject to change without notice. This website is just for the purpose of information only and not to be considered as an official website. This website belongs to official Channel partner of Arvind Smartspaces.